Sea Kraits are pretty much endemic to Asia - we don't get them in Australia except for the very very rare waif - people often misidentify Australia's true sea snakes (which have severed their ties with the land completely because they bear live young) with the amphibious sea kraits which lay eggs on land and also bask on land to assist in the digestion of food. 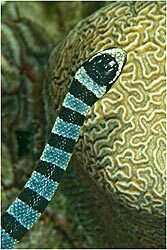 This is also known as the colubrine sea kraitor yellow-lipped sea krait. They are found in tropical Indo-Pacific oceanic waters and in parts of Southeast Asia and the Pacific Islands.. They are found in shallow waters around coral islands, reefs and mangroves. In Australia they live off the coast of Queensland and New South Wales. Males typically grow to around 75 to 90 cm, females are larger reaching up to 140 cm. The snake is blue or blue-grey with 20 to 65 black bands. The underside is yellow or cream. The snout, upper lips and a bar above the eye are yellow. The tail is vertically compressed. 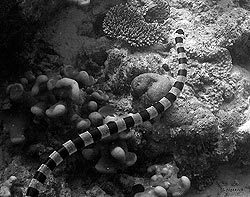 Banded sea kraits are often seen in large numbers in the company of hunting parties of Giant trevally and Goatfish. They need to drink freshwater and regularly come onto land resting and nesting on rocky headlands and beaches. They eat eels and small fish. Their venom is highly toxic but they are normally quiet animals and rarely bite. Their main predators are eagles and sharks. Their tails look very similar to their heads which may be a defense against predators. The Banded Sea Snake is a member of the only egg-laying sea snake genus. They lay their eggs (clutches of 4 to 20) on land and spend up to 50% of their time on land where they also digest their food, shed their skins and mate. There are six species of laticaudid sea snakes. They are found throughout the Indo-Australasian area, ranging from southern Japan and the Bay of Bengal in the north to Tonga and Somoa in the east, and to Tasmania and New Zealand in the south. Philippines Presented by Sea Rider Dive Center.